Episode three of season 4.5 is here! And since I don’t want to drag things out with a long intro, let me just recap what happened last week as quickly as possible. Maggie and her group find the bus and all people aboard it are dead, but find no trace of Glenn. Tyreese and the girls are found by Carol, Judith is still alive and with them. They find out about a safe haven named Terminus and go looking for it. Glenn finds Tara and sets out, and is found by Abraham, Rosita and Eugene, some new blood who got guns and a big honking army truck. And that’s what happened last week. Here’s what happened this week! The episode opens with Tara in the back of the army truck, taking notes on where her new “friends” are taking her. 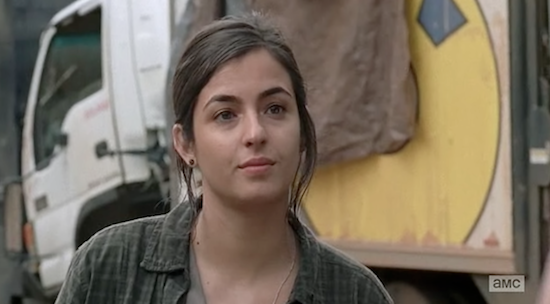 They stop to dispatch a group of Walkers, and Tara witnesses Abraham singlehandedly kill three. She notes how he did it all with a grin on his face and a sense of humor, to which he replies that he’s “the luckiest man in the world”. Glenn wakes up in the back of the truck, demands that Abraham pull over and tries to leave. Abraham stops him, tells him that they are on a mission which may decide the fate of the human race, and introductions follow. They are Sgt. 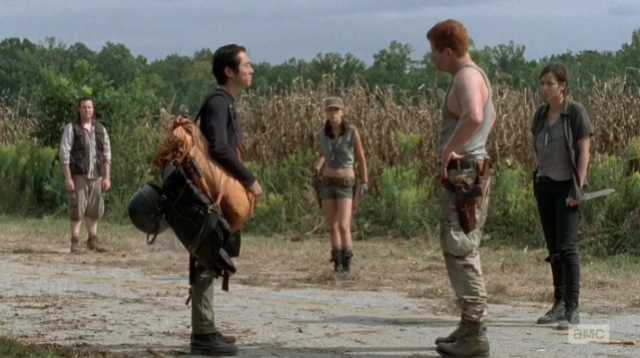 Abraham Ford, Rosita Espinosa and Doctor Eugene Porter; and apparently, Porter knows what caused the mess and needs to get to Washington DC. He reveals that Eugene was talking to people in Washington on a satellite phone, but for the past few weeks, no one has been responding. He asks for Glenn and Tara’s help since they know how to deal with Walkers, but Glenn is intransigent. Tara tells him she’s been keeping track of their route since they got picked up, and that she can get them back to the bus. 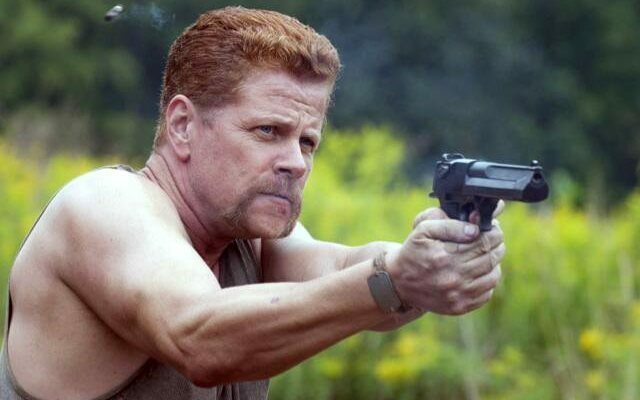 Abraham tries to convince him by telling him his wife is surely dead, and Glenn responds by slugging him. A fight ensues, which Tara and Rosita try to break up. But they only stop when Walkers are approaching and Eugene starts clumsily shooting at them. The others join in and take out the herd, but the truck is damaged and begins leaking fuel. Glenn and Tara depart yet again, and the others decide to follow. At the house, Michonne and Carl are having breakfast; they laugh, until the subject turns to Judith. They go out in search of more food, leaving Rick to rest and watch the house. Rick confides that he’s happy to have Michonne around, since Carl is in need of friends. While out, Michonne and Carl bond by speaking about her past, which includes how she lost her son, Andre Anthony. While searching one house, Michonne finds her way into a child’s bedroom and discovers the bodies of the entire family laid out on the beds, having all died in a suicide pact. When Carl comes, she closes the door quickly. When he asks if there is a baby in the room, she lies and tells him it’s a dead dog. Carl responds by opening up about Judith’s death, saying he hopes she and Andre are somewhere together. 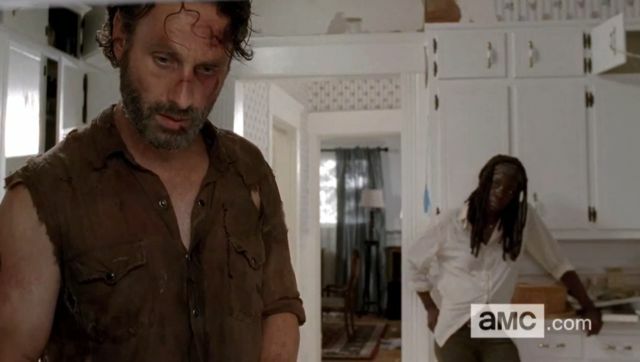 Back at the house, Rick begins to hear voices and realizes he is not alone. When a armed man appears, he sneaks under the bed and hides. The man comes in to inspect the room and ends up taking the bed, leaving Rick underneath. Another man comes in soon thereafter and they begin fighting over the bed. One is killed by the other, and looks Rick in the eye before he is strangled to death. 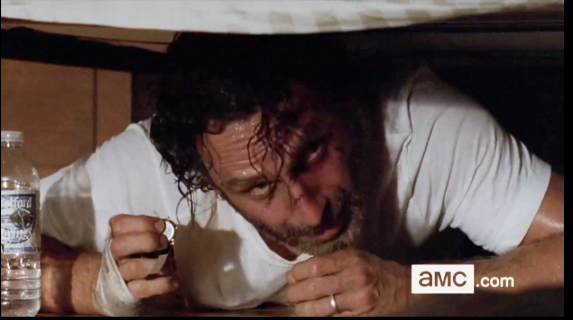 Rick eventually slips out and hides in another room just as the intruders begin to gather back on the ground floor. He hides in a bathroom and comes face to face with one of them, and is forced to kill him. Taking his weapon, he sneaks out the window and finds his way outside the house just as Michonne and Carl are returning. He runs to them and they begin to run off together. On the road together, Abraham tries to appeal to Tara’s sense of reason by espousing their importance of their mission. They come to an agreement of sorts that they are all doing what they think is right because they are good people. 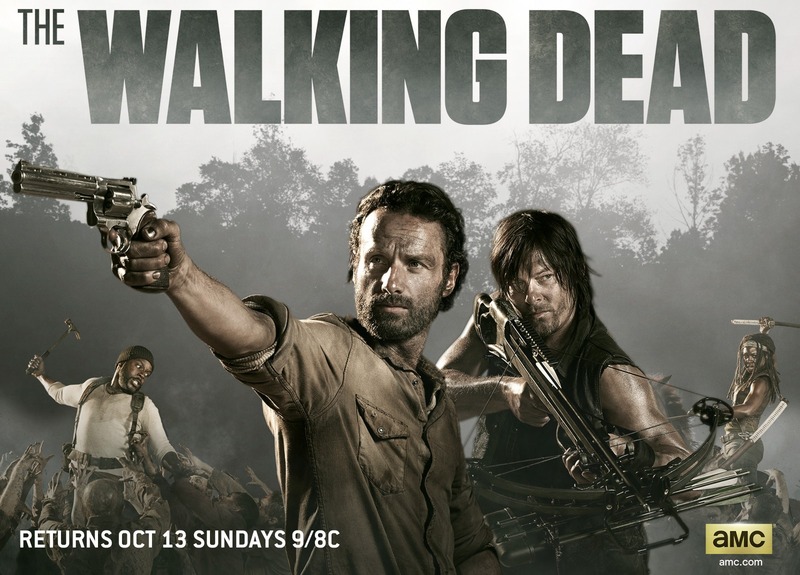 Elsewhere, along the railroad tracks, Rick, Michonne and Carl come upon a map indicating the location of Terminus and decide to head there too. First off, let me say that I enjoy what they are doing with the show at this point. This is to be expected thanks to the introduction of Abraham, Rosita and Eugene, and the rather appropriate casting choices for them. Michael Cudlitz, Christian Serratos and Josh McDermitt manage to look the part of these characters very well, and so far, the character they are striking seems pretty accurate too. Also, the way they have introduced these characters and their plot element at this point, though it does diverge from the comic book somewhat, works when paired with the other character’s trying to find their way in the wilderness. And the way they’ve inserted bands of marauders is akin to other elements in the post-prison part of the comic. For one, it adds some sense of urgency, showing how people are being pulled in different directions. And now, it seems likely that everyone is going to converge on Terminus, and I think I know what they will find there. On the one hand, they might choose to go with something out of Volume 11: Fear the Hunters (which the roving band of armed men in this episode made me think of). On other hand, they might choose to fast forward and go directly to Volume 12: Life Among Them which deals with the groups discovery of a working safe zone where they hope to build a new life. However, this seems unlikely at this point, as there is plenty of material that this would circumvent – good material that all took place between the prison being overrun and the entire group heading together to Washington.